Tensions over the impasse have reached a new peak. Prime Minister Justin Trudeau will make a stop in Ottawa before heading to Paris and London. OTTAWA — The Prime Minister's Office says Justin Trudeau will sit down Sunday with B.C. 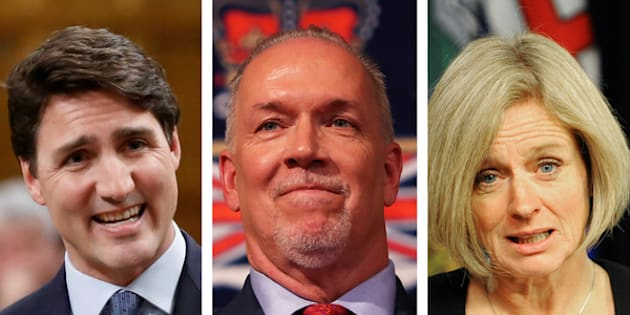 Premier John Horgan and Alberta Premier Rachel Notley in an effort to hash out a solution to the ongoing dispute over the Trans Mountain pipeline project. Finance Minister Bill Morneau met Wednesday with Notley, after which he said the federal government would meet the company's May 31 deadline for action. Ottawa has jurisdiction for the pipeline and approved it in 2016, but Horgan has thrown up a number of road blocks, including a lawsuit over the approval process and a threat to prevent oil from flowing through it, all of which helped spook Kinder Morgan's investors.